When I first saw that Pat Flynn from Smart Passive Income was doing income reports back in 2012 (he’s been doing them for longer than that; 2012 was when I first noticed), I thought that it was a really good idea, and I started considering doing it myself. But after I saw about a dozen or so other bloggers publishing their own reports, I had second thoughts. In general, I’ve adopted the notion that if everyone else is doing something, you should be turning and running the other way. However, after reading How To Make Money Blogging: What We Can Learn From 23 Successful Bloggers (which I also mentioned in the June roundup), I had to reconsider. Income reports allow for more transparency. Plus, without sounding like a guru, I have found that what you focus on tends to expand. If you’re focused on making more money, it seems pretty obvious that you will begin to find more ways of generating income. 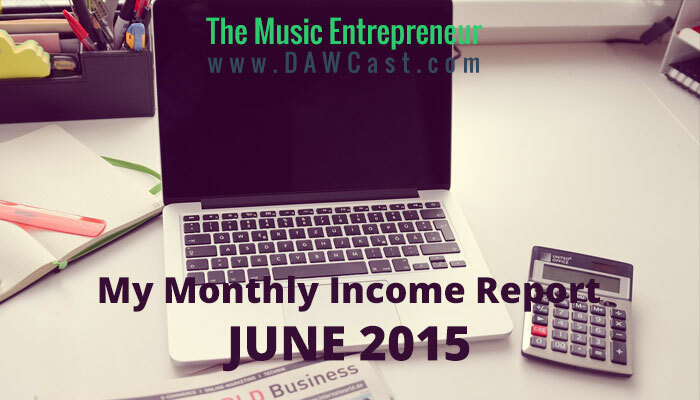 So, here is my first ever income report. The numbers do not reflect income that was made solely online. This should be fairly apparent based on the breakdown, but I thought I would make note of this fact just in case. I’ve included all music-related income in my breakdown. I wasn’t sure whether or not I should talk about income that was coming from non-online sources, but when I considered the fact that the vast majority of people looking at this would be musicians, I thought it might be helpful. Technically, I could have included income coming from being a theatre technician (and other sources) as well, but that role tends to involve a lot more than just music and sound. If you think I should be talking about that stuff, feel free to let me know your thoughts on this. The numbers don’t necessarily represent income that was made directly from my website. Aside from affiliate commissions and digital product sales, which so far have been few and far between, I do not make any money directly from this website. I do believe that having a website has indirectly led to some income-producing opportunities, however. These numbers do not represent all of my income. I’ve talked about the fact that a good chunk of my income comes from music industry related activities in the past, and that is true. However, I have not included any income here that does not directly tie in with music in one way, shape or form. The dollar figures are in Canadian dollars. Although I do get paid in American dollars for some of my work, that’s mostly to my advantage since the US dollar is much stronger right now. All numbers have been converted to Canadian dollars. Music instruction tends to come to a lull during the summer months, so I may not have much to report on in that regard for July and August. Live performance can also be a moving target during the summer, though I do have a show or two coming up that will pay. Meanwhile, I’m seeing some growth in freelance blogging opportunities, and I have little doubt that my new eBook will start catching some momentum as well. Consulting: I have yet to really begin my career as a consultant, but it has been in the back of my mind for a while. I believe consulting will provide me with amazing opportunities to connect with musicians and industry people. Product sales: they have been a little slow out of the gate, but based on the promotions I plan on running, I believe there will be a renewed interest in these offerings. Advertising revenue: I have experimented with ads on this site in the past, but only to a small degree. So far I haven’t really found a good way of implementing them without cluttering up the site, but I’m thinking about running some new experiments. Affiliate commissions: based on projected traffic growth and new strategies I will be implementing, I believe I will begin to see more affiliate product sales. Podcast sponsorships: so far, either the timing hasn’t been right, or the audience just hasn’t been big enough. However, the last few months have proven instrumental to the growth of the podcast. I believe finding the right partners will only be a matter of time. Speaking engagements: a book is a glorified business card. Along with consulting opportunities, I believe my eBook will also open up more opportunities to speak. Conventions: I would like to start organizing yearly music conventions on a local level. I don’t have any solid plans for this yet, but it’s something I’m keeping in mind for the future. Subscriptions/memberships: I am thinking about offering exclusive, member-only content to those who sign up for it. This is something I will be experimenting with in the near future.